Joanna M. Wezyk’s palette of darkened crimson hues and saturated tones construct intense and passionate atmospheres in the paintings from her bedchambers series. Each work invites viewers to experience an enigmatic journey into the private realms of European châteaux that could potentially illustrate the romanticized settings of an Ann Radcliffe gothic novel. However, the hauntingly dark and ambiguous royal bedchambers depicted in Wezyk’s works are not of fictitious places but spaces that exist today as public tourist attractions. These bedchambers are spaces that once functioned as the private and sacred boudoirs and bedrooms of European royalty. These now unoccupied bedchambers have been unlocked to the public and are on display to individuals touring sites of medieval architecture. While many of us may not be able to travel to Europe to explore these sites, Wezyk’s works give us unique access to these mysterious spaces. Carefully concentrating on the intimate experience of the space, Wezyk maintains use of small canvases throughout the series, ranging in sizes from 18”x14” to 20”x16.” The smaller scale of these surfaces prompt viewer’s to engage closely with the works. As such, viewers may feel a sense of apprehension while gazing at Wezyk’s canvass; they create a voyeuristic experience of peering through tiny keyholes into private spaces. Joanna M. Wezyk, Chateaux de Azay le Rideau from The Royal Chambers series, 2009, oil on canvas, 18″x14″. Image courtesy of the artist. Wezyk’s exploration of royal bedchambers provides a glimpse into her process of blurring public and private spaces. For decades these rooms were locked away and guarded. Today, all that separates a viewer from the bedchambers are small rope barriers. These are particularly noticeable in Wezyk’s Chateaux d’Azay le Rideau Memory (2009) depicting a bedchamber in the French Renaissance châteaux, Château d’ Azay-le-Rideau. In this intimate work as in many of her bedchambers, Wezyk incorporates non-threatening details like velvet rope barriers to serve as reminders that these are not wholly imagined spaces. In reality the bedchambers remain exposed to the public as historical monuments. 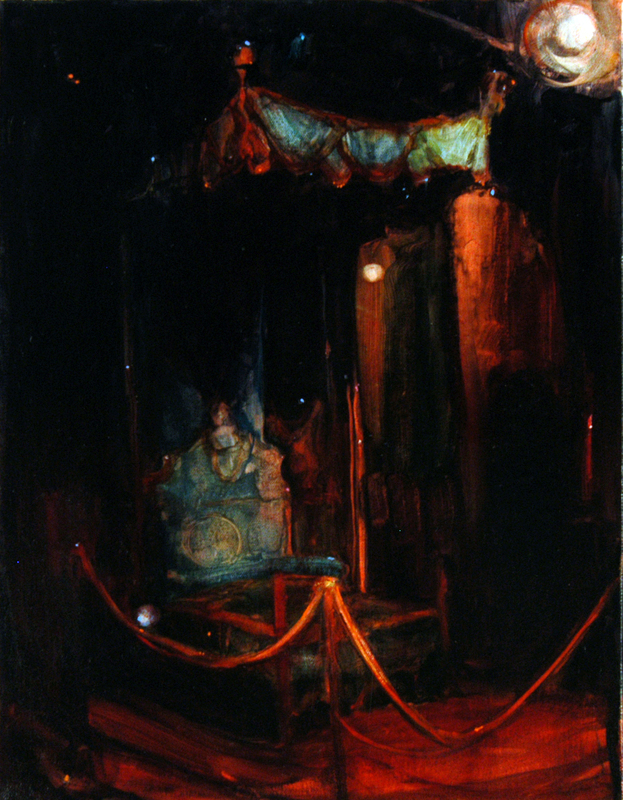 Joanna M. Wezyk, Royal Chamber from The Royal Chambers series, 2009, oil on canvas, 18″x14″. Image courtesy of the artist. Wezyk’s paintings evoke a sense of the mystery that once shrouded these secret and intimate spaces. For example, in Royal Chamber (2009), Wezyk’s dark brush strokes create small areas where it is hard to extract details. 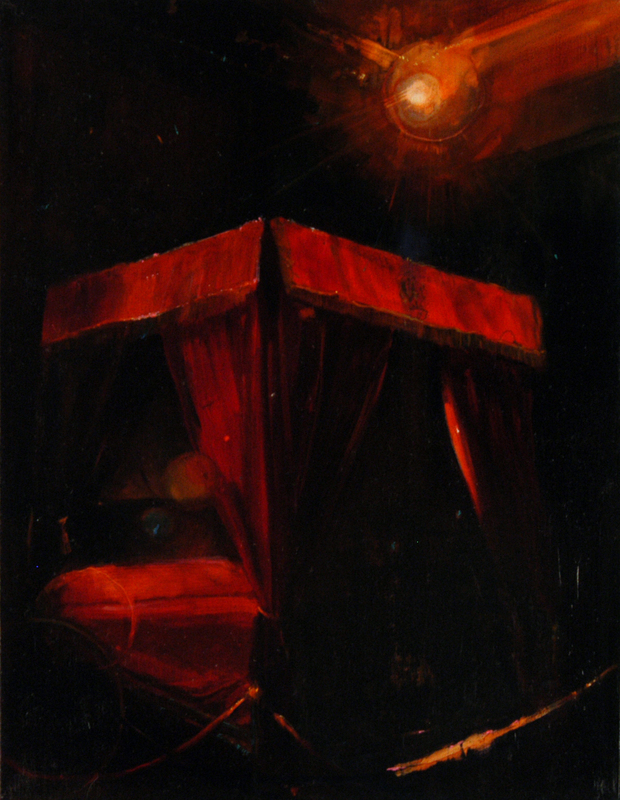 By employing this technique, Wezyk retains an essence and awareness of the mystery imbued by these once private spaces. In a way, Wezyk’s detailed vignettes of the bedchambers spotlight areas within the larger context of the royal living quarters. However, the impossibility of discerning the entire space reiterates the idea that these remain secret domains locked within private realms. Joanna M. Wezyk was born in Krakow, Poland. She currently lives and works in New Jersey and New York City and is represented by Tina Kim Gallery, New York and Kukje Gallery, Seoul, N. Korea. Rana Edgar holds a BFA in photography from College for Creative Studies, Detroit, MI, and an MA in art history from the Savannah College of Art and Design, Savannah, GA. She has an interest in researching and writing about cinematic photography and has recently worked on research project with artist and curator Fred Wilson. 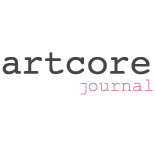 This entry was posted on June 15, 2012 by artcore journal in Volume 1, Issue 1: Northeast and tagged joanna wezyk, private space, rana edgar.